There are as many recipes for Koliva as there are Greek grandmothers! Here is a simple recipe that makes a small amount suitable for the size of our Mission Parish. You can get as fancy as you like with the decoration on top- just make sure all elements are edible. Rinse and drain the wheat. Cook it as you would rice, for about 45 minutes to 1 hour. Do not overcook so that the grains explode. Since there is more water in the cooking than there would be for rice, check the wheat as it's cooking for doneness. Pour the hot wheat into a large or two smaller colanders. When drained, put the wheat into a large bowl. Cover the wheat with very cold water to stop the cooking. Drain again. 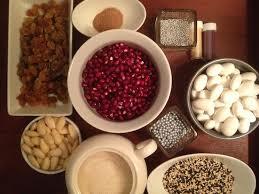 In a large bowl mix the wheat with the cinnamon, nuts, raisins, and parsley or mint. Transfer the mixture to the bowl to be taken to Church. Place a piece of waxed paper on top of the mixture and flatten the top so that it is evenly distributed. Sprinkle the zwieback or graham cracker crumbs evenly over the wheat mixture. This keeps the moisture from the powdered sugar layer. Sift the powdered sugar atop the crumb layer. Use the Jordan almonds to form a cross atop the powdered sugar. The edge of the bowl can be lined with Jordan almonds if desired. Plan to be at Church before Liturgy begins so that you can give the bowl and your list of names of your deceased family and friends to the priest. A candle is often placed in the bowl and lit during the memorial service. Koliva is the traditional boiled wheat dish made in remembrance of the dead in Greece and throughout the Greek diaspora. The recipe, though simple to prepare, requires time and patience and care. And in a wonderful way, because the process is somewhat lengthy, making koliva ourselves instead of buying it allows us this time to spend with the memories of loved ones no longer with us. Today we all have such full and often hectic schedules that homemade koliva just seems out of the question. I’m here to tell you, you can do this! The koliva recipe below is broken down into steps and stages, making this a completely doable project and a special tradition to keep in our families. Briefly, memorial services or mnemosina in the Orthodox Church consist of prayers for the souls of those who have fallen asleep and the service itself is basically an abbreviated funeral service. It is interesting to note that the Orthodox Church often uses the phrase ‘fallen asleep’ in place of died as a reminder of the resurrection and promise of eternal life. We see this reflected also in our English word cemetery comes from the Greek κοιμητήριον or sleeping place and the Feast of the Dormition of the Theotokos in August which is, in Greek, Κοίμησις Θεοτόκου (Kimisis) or falling asleep. Koliva can be decorated very simply or in some cases involve extremely elaborate designs. Koliva for individual memorials or funerals will often also have the first and last initials of the departed incorporated into the design. Almost every koliva will prominently feature a cross in the design and this can be as simple as two freehand straight lines of almonds or highly detailed creations. Here is a sheet of 4 simple stencils that you can print out to help the less than artistically inclined like myself! Please remember, all decorative elements must be edible! The entire koliva, decorations and all, will be mixed together before serving so make sure not to add anything that might send someone to the dentist. For more koliva design ideas in addition to those featured in this post just search for ‘koliva’ in Pinterest – some are absolutely amazing! You can go as far as mixing all the ingredients into the cooked wheat and keep in a Ziplock back in the refrigerator for up to 3 days ahead. Then plate and decorate on the night before or morning of the memorial service. Soak wheat berries for approx. 8 hours or overnight in 10 cups of cold water. Drain, rinse and add to large pot with 8 cups cold water. Bring to a boil, lower to a simmer and cook for about an hour until soft but not mushy. Grains of wheat will begin to plum and almost split. *Add a cinnamon stick, the peel of 1 orange or 1 tsp anise seeds to the boiling water for extra flavor. Drain cooked wheat well and transfer to a clean, lint free towel or sheet laid on countertop. Spread wheat out in a single layer. Allow at least 3-4 hours to dry completely, preferably overnight. You can do this up to 3 days ahead and store, covered in the refrigerator. • Lightly toast almond flour in frying pan over VERY low heat until just soft brown in color. This takes a few minutes and it may not seem like anything is happening but stir frequently and be careful not to burn! Set aside. • Lightly toast sesame seeds in frying pan over VERY low heat for max 3-4 minutes until the seeds just begin to release their sesame aroma. Set aside. • Cut and de-seed pomegranate and set aside on paper towel to dry. • Chop fresh parsley well and set aside. *Make sure to rinse parsley well and pat dry before chopping. • Chop walnuts into small pieces and set aside. • Break up golden raisins/sultanas, soak in boiling water for 15 min, set aside. Once wheat is completely dry, transfer from towel/sheet to large bowl. Combine wheat with other ingredients except the powdered sugar. Remember to reserve 2/3 cup toasted almond flour. Mix gently and well to incorporate everything completely and plate. Pat down gently. Transfer wheat mixture to bowl or platter of your choice and gently pat down. Cover with remaining 1 cup of toasted almond flour and pat down gently and well. A piece of wax paper does this job perfectly. When the wheat mixture is no longer visible, carefully sift powdered sugar over the almond flour. Pat down and smooth with wax paper. Decorate as desired. BE VERY CAREFUL transporting the koliva to church! Consider decorating your koliva at church if you are going to make an intricate design – this is a great option and much less stressful! * Alternate options include crushed paximadia, graham crackers breadcrumbs, or toasted chickpea flour: If using zwiebacks (paximadia) or graham crackers, make sure these are crushed very fine. Remember that they will add to the overall sweetness of the koliva. If you refer a less sweet finished dish, consider going with the breadcrumbs or toasted flours. This recipe makes approx. 7 cups of koliva that is ample for a large platter for a funeral service or individual memorial. You can use half the recipe (and freeze the other half for up to 6 months) for Saturday of the Souls when other people will also be bringing koliva on the same day. For a very large funeral or large memorial service, simply double (or triple) this recipe and use a sheet pan to accommodate the larger amount with doilies tucked underneath to fancy up the pans edges. 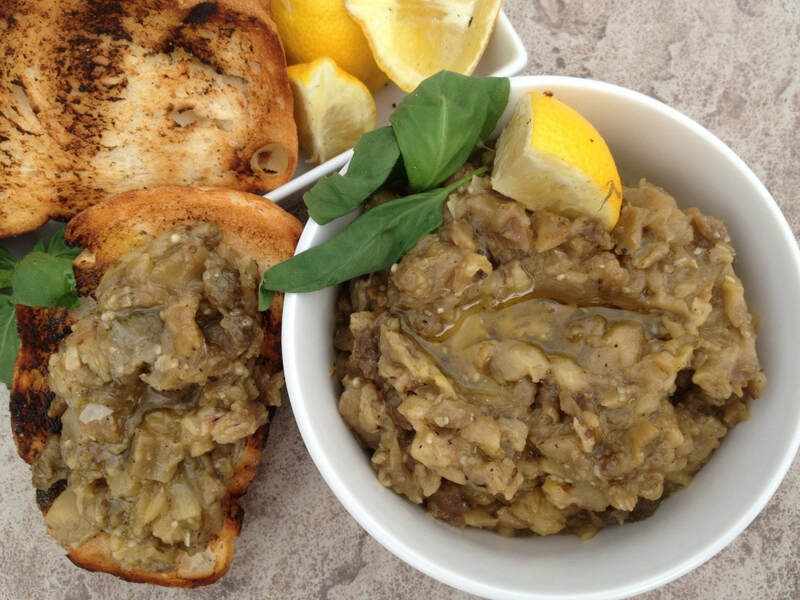 Thanks to Kiki from the Greek Vegan for this recipe! The tradition of baking a Fanouropita is a great honor bestowed upon St. Fanourios the Martyr and Miracle Worker. It is typically a small, round cake and is made whenever the saint reveals a lost object, a job, a cure or anything else the person has sought to find, is found. Mix flour and cinnamon in a large bowl. In another bowl, mix oil, sugar, orange juice, water and lemon peel. Beat well. Add baking powder, salt, raisins and walnuts to the first bowl. Mix well. Add dry ingredients to Bowl 2. Grease and flour a baking pan. Bake for 45 minutes @ 350 degrees. tip: If you let the cake sit a day before serving, it absorbs the flavors better. 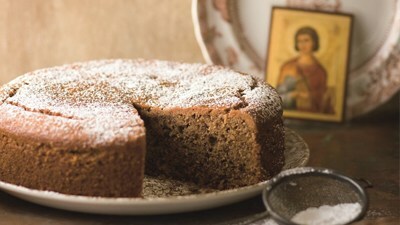 *It is also a tradition for each person to say a prayer for St. Fanourios’ mother when eating their slice of the cake. The pita’s can also be brought to church to be blessed and shared among the people. There is a beautiful icon of St. Fanourios located at the church of St. Syridon in Palos Heights, IL. St. Spyridon’s church also has a beautiful little book that contains the life and Paraklesis service to the saint. Call 708.385.0787 to order a copy. It is the only book I have been able to locate on St. Fanourios. We’re in love with this easy zucchini pasta recipe. There’s fresh zucchini, tomatoes, basil, parmesan, and lots of garlic. Plus, it only takes 20 minutes to make. Make this with 100% zucchini noodles or swap half of the zucchini with regular (pre-cooked) spaghetti for a heartier meal. This recipes uses OLIVE OIL. Trim and spiralize the zucchini (see notes below for how to do this without a spiralizer). Cut extra long noodles so that they are about the length of spaghetti. Add olive oil, garlic, and the red pepper flakes to a large, deep skillet. Turn to medium heat. When the oil begins to bubble around the garlic, add the zucchini noodles. Toss the noodles with pasta tongs and cook until al dente — they should be wilted, but still have a crunch; 5 to 7 minutes. Do not let the noodles cook any longer or else they will become mushy. As they cook, keep tossing so that all the zucchini noodles have a chance to hit the bottom of the skillet. Stir in the tomatoes, basil, and parmesan cheese. Cook for one minute. Use pasta tongs to transfer the noodles, tomatoes, and basil to a serving dish. Leave the liquid in the skillet. Bring the liquid to a simmer. Combine cornstarch and cold water in a small bowl then whisk into the simmering liquid. Cook, while whisking, until the liquid thickens to a sauce; about 1 minute. Taste the sauce and season with salt. Pour the sauce over the zucchini, tomatoes, and basil. Finish with more parmesan cheese on top and serve immediately. How to make Zucchini Noodles without a Spiralizer: The spiralizer is not the only way to make noodles. You can use a julienne vegetable peeler or a mandoline. You can also use a standard vegetable peeler to make wide noodles or ribbons. Thanks to Inspired Taste for this delicious recipe! 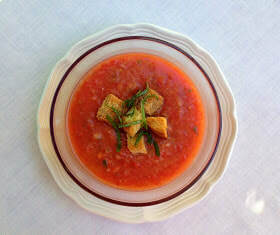 Gazpacho is basically a liquid salad. It takes only minutes to prepare, but the soup needs to be chilled for several hours or overnight, so plan ahead. You can adapt the texture from chunky to smooth to suit your personal preference. Any variety of tomato or a combination works well. This is a great soup for summer fasting on 'oil' days. Combine all ingredients except the croutons and basil in a blender or food processor and process to desired consistency. Chill several hours or overnight. Adjust seasonings to taste. Serve in chilled bowls garnished with croutons and fresh basil ribbons. *If the cucumber is organic, I don't bother to peel it. To create basil ribbons (to “chiffonade” the basil) for garnishing the gazpacho or bruschetta, rinse fresh basil leaves and gently pat dry. Stack the leaves on top of each other on a cutting board. Beginning at one of the pointy ends, roll the stack into a tight cylinder. With a sharp knife, carefully cut the roll into thin slices. Don't let those heels no one likes go to waste. Turn them into crunchy croutons for garnishing soups, salads and casseroles. Cut bread into 3/4-inch cubes. Place in a large bowl and drizzle with olive oil. Sprinkle with fine sea salt to taste and toss very well. (You can also add a fresh-pressed clove of garlic, but it really smells up the house when the croutons are toasting.) Could also use seasoning salt, onion powder, etc. Spread on a baking sheet and bake at 350 degrees for 15 to 20 minutes or until crisp and golden brown, stirring occasionally. Use immediately or let cool and then store in an airtight container. Note: If I were doing a very small amount, I would just sauté the bread cubes in a little olive oil in a pan on the stove. ~ Recipe courtesy of "Flavors of the Umpqua"
This is a delicious spread to eat doing those hot days of the Dormation Fast! Thanks to Kiki over at the Greek Vegan for this (and a million other) delicious recipes! Add seasoned mashed garlic paste, 1/3 cup good quality olive oil (or substitute a Fast-Friendly oil) and 2 tbsp fresh squeezed lemon juice. Mix very well until completely combined. That’s it! Serve over grilled bread or with homemade pita chips, all on its own or as a side dish to just about anything! This recipe should give you a little over 2 cups of melitzanosalata.